Hallelujah and pass the brisket! That’s the joyous, almost religious experience I had eating at the Iron Pig. Brisket is my least favorite category in competition because it’s usually tough, or overcooked, or just not moist…..at all…almost ever. But Iron Pig has Chef Rick Daniels, who hails from Texas. He also used to hail from the house right behind mine in Ocean Beach just two short years ago. Here we were neighbors for 3 years and I never knew he was a chef! He grew up in Austin, so the man knows how to low and slow cook with the best of them. He used to work here in San Diego at Whisknladle. Kenny Casciato, one of the owners at Iron Pig, stole him away and I’m SO glad he did. Rick even told me he has a sous chef. Kind of unheard of in a BBQ restau. On the weekends, it’s a busy place (Hey, it’s PB) and they’re cooking 12-15 briskets a day. 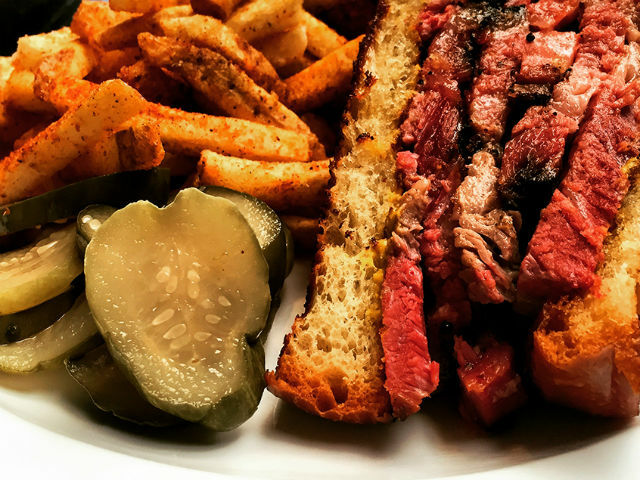 On certain days of the week Chef Daniels makes a tasty pastrami sandwich. Always a good idea to call ahead to see what the Chef is cooking up for a special. So, back to the food. And glorious ‘Que it is. Rick served me a bit of almost everything. The aforementioned brisket, with a layer of fat running along the top of the slice, to keep it uber moist. Damn, it just melted in my mouth, so very tender. Soon as you cut brisket, it dries out, but not this one. Keep that in mind when taking brisket to go and realize that it’s better right out of the kitchen. The layer of bark had a nice crusty ribbon on top of each slice. Smoky flavor just adds another layer. On my second visit, I had his brisket sandwich which is served on the only thing not made in house, their Texas toast. What a delicious and satisfying sando. 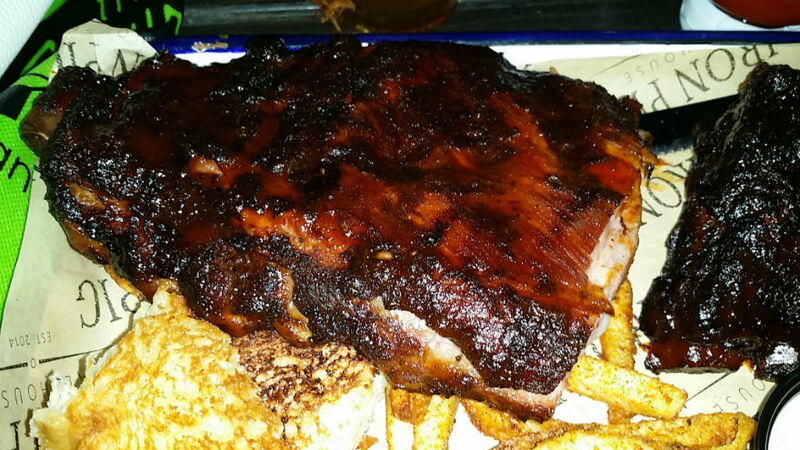 If you’ve read any of my other reviews, you know I’m the rib girl. As in, my #1 favorite dish. 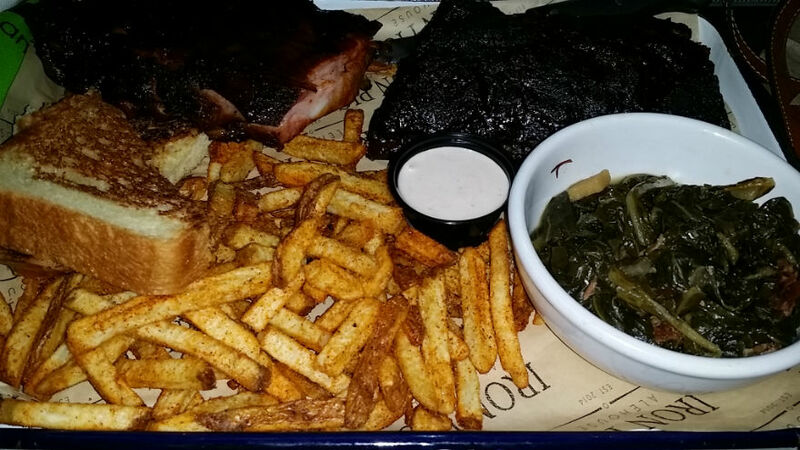 I got a half rack of his baby backs and a half rack of their spare ribs. 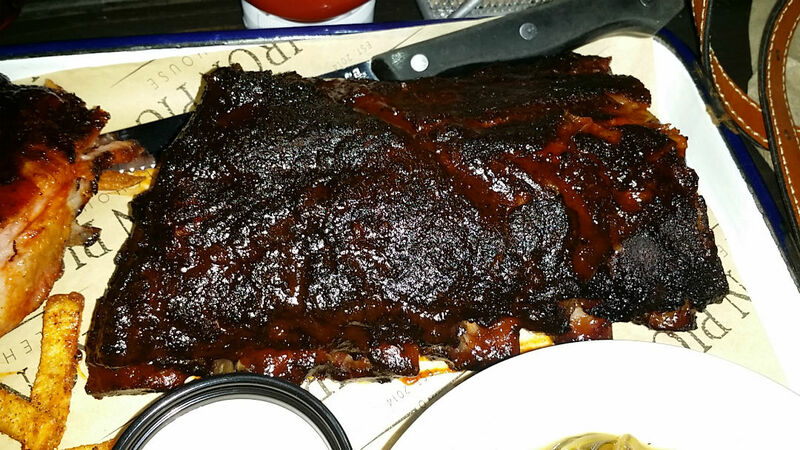 Wow…talk about some of the best ribs ever. Their ribs are smoke kissed and I wanna make out with them forever! They are perfectly textured, melt in your mouth, succulent and very meaty. They didn’t even have these on my first visit because the spares are only served at night and I was there at lunch time. 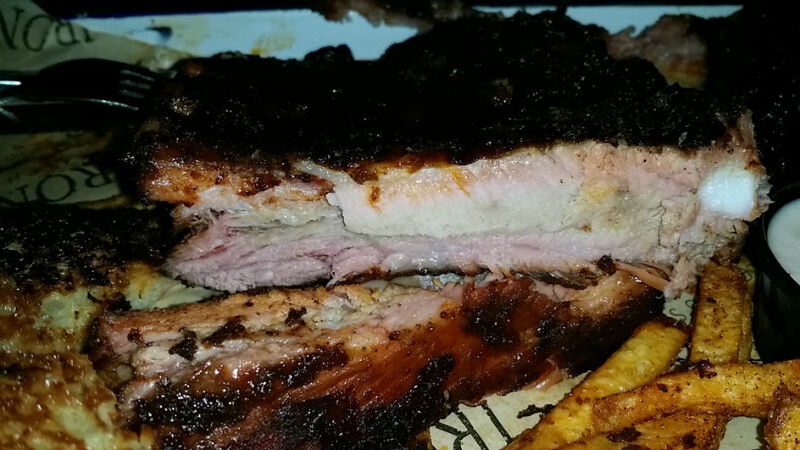 Loved the bark on these ribs and how dark looking it was. These are definitely up there as my number one spot along with Cali Comfort, although, both very different in taste. Rick says they are all dry rubbed the day before, then they smoke them. When ordered, they are grilled with a glaze of sauce on them for some shine. This is exactly how I love them. Gonna marry dem bones. 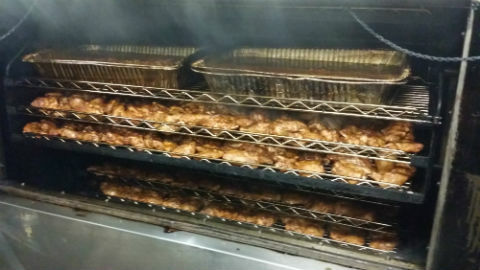 I also had some of his brined (for 24 hours) smoked chicken wings, which is already getting raves in reviews I read. I’m joining in on that rave too. Wow, what a burst of smoky flavor, with a nice, charred crispiness to the skin. 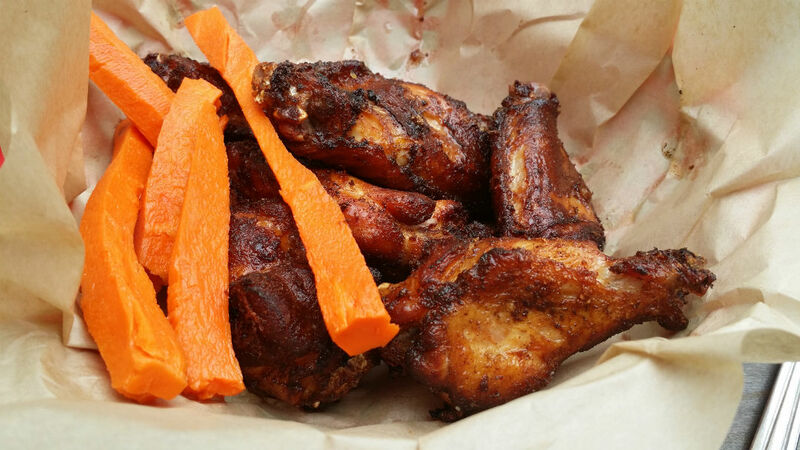 They’re served with in-house made ranch or blue cheese dressings, a glaze of BBQ sauce (you choose regular or spicy). I fell the dressings are totally unnecessary as the wings stand deliciously all on their own. The pulled pork sandwich was also incredibly moist, with a hint of smoke and flavor. 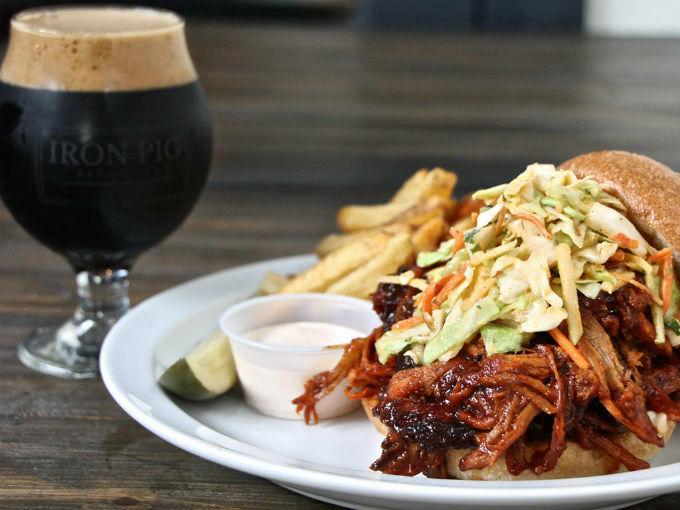 Piled with their delicious cole slaw and served on a toasted Brioche bun. Squirt some of his made from scratch BBQ sauce on the pork and you’ve got a first place winner there. His sauce has just the right amount of kick to it. Chef is even thinking of bottling that sauce. I’d like a case please. They also have rip tips served from smoked pork brisket. Yes please. Pork brisket is the the bottom half of the picnic ham and the boned bottom half of the full shoulder of the pig. Most I’ve had at other places tend to be rather tough. Not these. Very tender here. 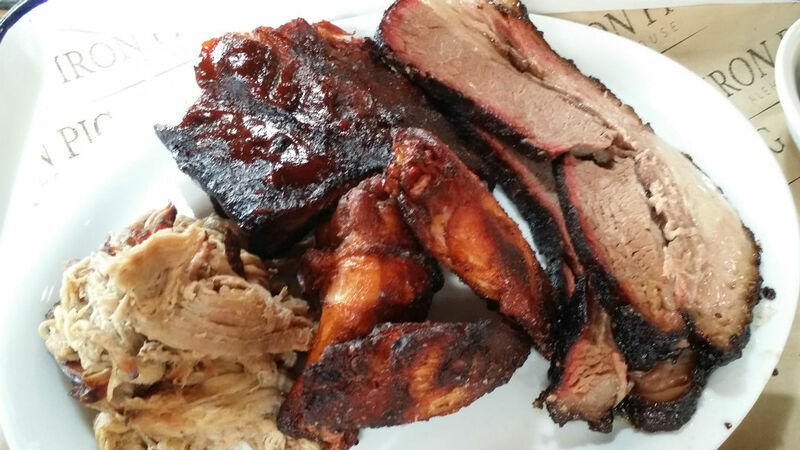 They use hickory wood and it’s giving all of their meats just the right smoky kick. One thing that stayed with me a long time besides the flavors on my tongue, was that every time I smelled my fingers, I could smell the smokiness of IPA’s proteins…this was after washing my hands! I’m the one in the corner still licking and smelling my fingers. The sides….wow. Rick said when they hired him, he told them he would only work there if he was allowed to make all his own sides from scratch, nothing bought from Sysco which so many others do. 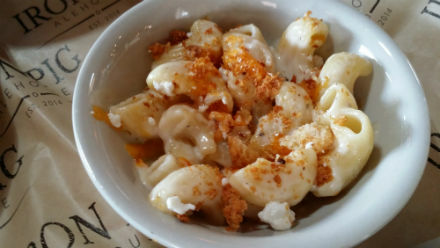 The line up…..
Mac ‘n Cheese….the first one I think I have ever liked in a BBQ joint. Smoked gouda, sharp cheddar, smoked cheddar, sprinkled with goat cheese and topped with Texas toast bread crumbs, hell yeah! Smoked Gouda Mac ‘n Cheese. All side portions are larger then shown here. 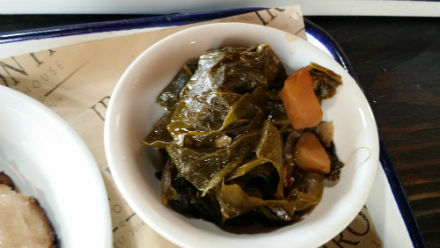 Collard Greens…again, the best I’ve ever tasted. Why? Because they put smoked pork in it and onion and garlic, that’s why. Tender and full of flavor. Wanna take a bath in that. 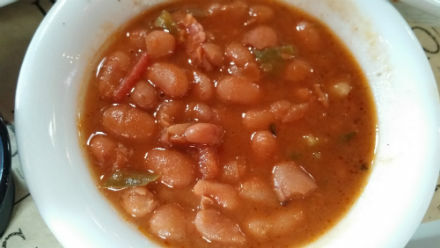 Slow cooked beans….smoked beans! Whaaat? Oh and pork belly, onion, garlic and more spices. Mmmmmm. Southern Slaw….apples, carrots, apple cider vinegar, cilantro, aioli. Not your average cole slaw. You can tell there is a talented chef in the kitchen. Potato Salad….red potatoes, egg, pickles, red onion, celery, parsley and aioli. A really standout pot salad. 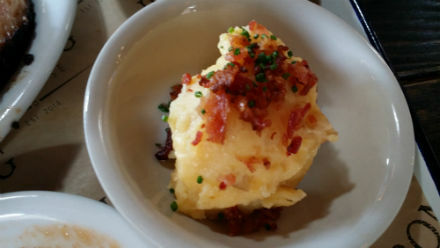 Baked Cheesy Smash….Potatoes, smoked sharp cheddar, sour cream and topped with bacon and chives. Oh yes, tastes as good as it sounds. Cheesy Smash. All side dishes are larger portions then what you see here. French Fries…..or crack fries they could be named. He sprinkles them with the same rub dust he puts on his ribs. Crispy and brilliant. And being from Texas, you know Rick had to have sweet tea on the menu. I had a few sips of that and I liked that it wasn’t overly sweet as most of them are. A cold and refreshing, non alcohol choice with your meal is what I like. But there are beers a plenty here. I took home some of their peach cobbler with a bourbon glaze and it usually comes with some of their home made vanilla bean ice cream, but I had to forgo the chilly stuff as I had errands to run afterwards. It did not disappoint hours later, but I was missing having that scoop on there. Next I have to try their key lime pie, you just know that’s gonna rock. Their lunch special was a half sandwich (supposedly huge) filled with your choice of brisket, pulled pork or chicken with half order of french fries for $7.99. 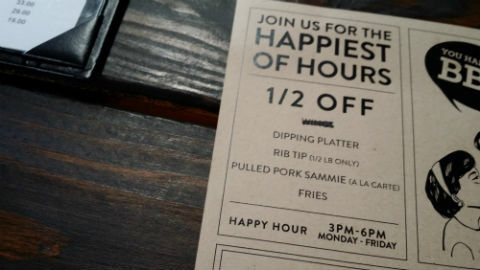 You can add in any of their happy hour beers for only $4 more. Done! Other enticing menu items include a trio of tacos each filled with brisket, pulled pork and chicken. Smoked Portobello sandwich, 3 salad options, one them with brisket, smoked Portobello fries (!) and goat cheese with a balsamic herb vinaigrette. Need some lettuce in your life? Besides a smoked beet and citrus salad and a house salad, they have one called the Man Salad. 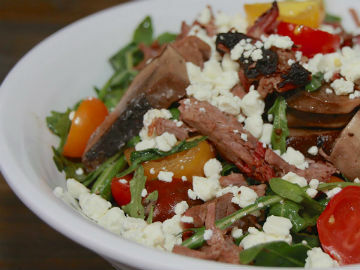 This is loaded with smoked brisket, smoked Portobello mushroom, homemade fries, Suzie’s farm organic wild arugula, tomatoes, goat cheese, house pickled red onion, tossed in house balsamic herb vinaigrette. Holy Smokes! 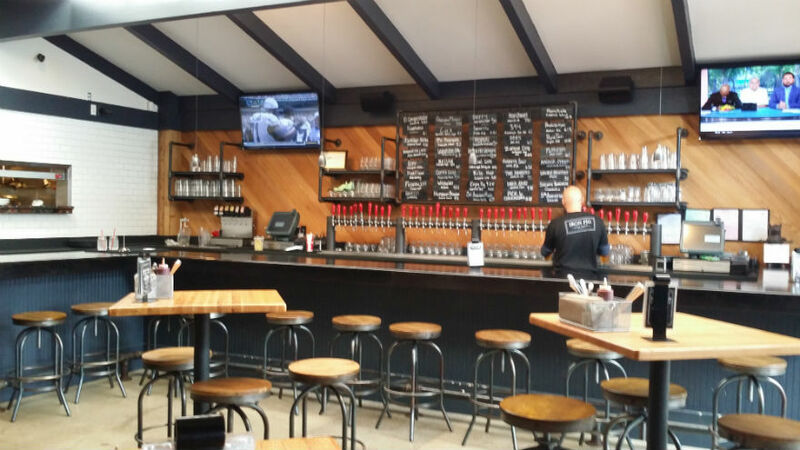 And of course, with alehouse in the title, you can expect an extensive craft beer program. It’s San Diego after all and we gotta have our crafty beers. Nice looking wine list too. The room is modern rustic and has several meat hooks with different size Edison bulbs hanging from them for a funky chandelier look. 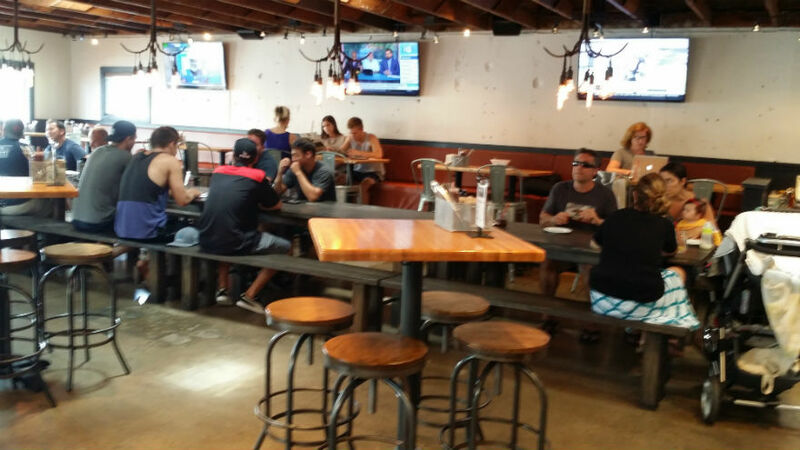 Hi tables and chairs with comfy booth type seating along one wall with long communal tables in the middle of the room and the bar area has some hi tables and chairs too. Nice patio in the front of the establishment which is dog friendly. There are flat screens throughout the place too. Even though they’re in the middle of the crazy vibe of Pacific Beach, there is a nice anti crazy vibe of being in a Texas steakhouse and hanging with your friends. I couldn’t be more excited to have some stellar ‘Que just a few miles from my house without having to drive a 40 mile roundtrip to one of my other fave BBQ places out in Spring Valley. This is one of the restaus that is on the Tasty Train without a doubt. I just know you’re gonna love this place. Write me and tell me I’m wrong. Go ahead, I just dare ya. Table service. Happy hour from 3-6. Half off some dishes and drafts. During football season they serve breakfast on Sundays from 9:30-11:30 am. As in most BBQ places, when they run out of Que, they don’t make more that day. Takes too long. Till midnight, ck web site for limited items available last couple of hours.